23 year old Krishan Kumar belongs to Faridabad, Haryana. He lost his vision when he was 3 years old. Sheer carelessness and negligence on part of the doctors, caused a mere sty on his eyelid to completely damage his eyesight. He had a keen interest in studies so his parents enrolled him in a blind school at the age of 5 in Hisar, Haryana. His tragedy didn’t end here and at the tender age of 7, he lost both his parents. Following the parents’ demise, his grandmother took care of him and ensured that Krishan completed his studies. After completing his schooling, Krishan enrolled in a 6 month computer training course from Faridabad, Haryana. He completed his graduation from Kurukshetra University and is employed as a Computer Trainer with an NGO working for disabled in Delhi. He recently married a visually impaired girl, who is a graduate seeking a job. Krishan Kumar learnt about Eyeway service on the Hamari Vaani audio channel and he called for help to acquire a Plextalk DAISY player. Our counselor informed him about central government’s ADIP scheme under which assistive aids and appliances are distributed free of cost to persons with disabilities. Furthermore, the counselor provided contact details of two organizations authorized to distribute such devices to visually impaired people. Since then Krishan has been in regular touch with our counselor in Punjab and often calls for assistance on various issues. Educating him about the use of assistive technology, the counselor also guided Krishan to use Google maps mobile app for navigating across independently. Krishan in his present job teaches about 85 children who are a mix of sighted and visually impaired. He asked for guidance from our counselor to get government affiliation for a computer center operational in Rohtak. This center is owned by Krishan’s friend who is also a person with vision impairment. Imparting computer training to 35 blind students, they aspire to build capacity to train a lot more students in the future. Eyeway counselor apprised Krishan of the process of gaining government affiliation for this center. Krishan was asked to prepare a proposal mentioning number of students, curriculum, etc and submit it to the Registrar Office in Delhi. He followed the advice and submitted the proposal which is currently under process. Krishan Kumar is an example of hope for those who lose their confidence and start thinking of their life as a burden. In spite of having a tragic childhood, he didn’t stop believing in himself. 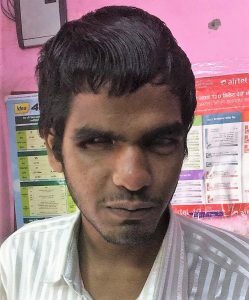 He empowered himself through education and now he is working for the betterment of several other blind children who stand an equal chance at an independent future.